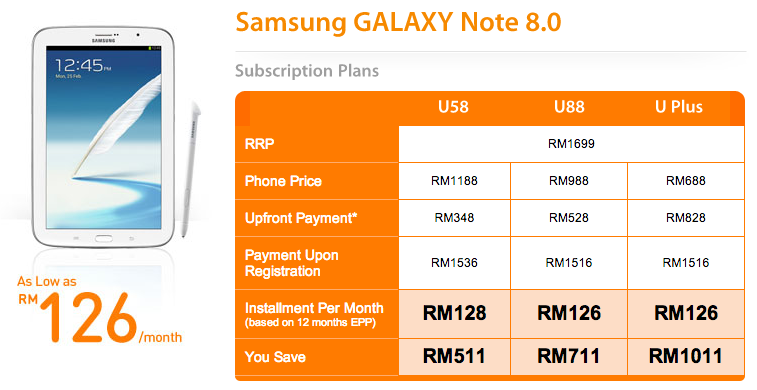 It looks like U Mobile has started offering the Samsung Galaxy Note 8.0 with its phone bundles, offering you the largest Galaxy Note line-up of devices from as low as RM688; the retail price is RM1,699. Available with a U58, U88 or UPlus plan, the Galaxy Note 8.0 bundle ties you up to a 24 months contract. Introduced back in February right before the Mobile World Congress 2013 event in Barcelona, the Galaxy Note 8.0 is an 8” tablet with a resolution of 1280 x 800. Powered by a 1.6GHz Exynos 4 quad-core processor, it has a moderate 5MP rear shooter and a 1.3MP front camera. Other specs include 2GB of RAM, 16GB if internal storage expandable via microSD slot, and has a generous 4,600mAh battery at the back. What makes this tablet from Samsung special is it comes with the S Pen and a suite of apps catered for the company’s very own stylus. Find out more about the tablet in our previous post or visit U Mobile for more information about the bundle.